Dental implants are a great way to replace missing teeth and also provide a fixed solution instead of having removable partial or complete dentures. 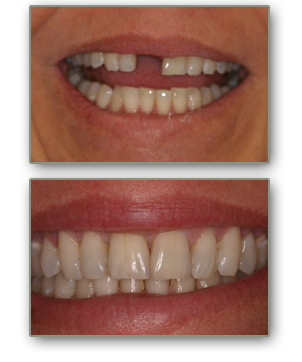 Implants provide excellent support and stability to the teeth being replaced. Dental implants are artificial roots (usually titanium) that are surgically placed into the upper or lower jaw bone by either Dr. Trylovich or Dr. Gifford. They are periodontists—specialists of the gums and supporting bone—with whom Dr. Simone has worked for over 20 years. The crowns or denture is attached to implant(s), resulting in a very natural look that will often enhance or restore a patient's smile. Dental implants are very strong, stable and durable and will last many years but, on occasion, they will have to be re-tightened or replaced due to normal wear. You will receive care instructions when your treatment is completed. Good oral hygiene, healthful eating habits and regular dental visits will aid in the life of your new implant.